American black ducks (Anas rubripes) and mallards (A. platyrhynchos) are morphologically and behaviorally similar species that were primarily allopatric prior to European colonization of North America. Subsequent sympatry has resulted in hybridization, and recent molecular analyses of mallards and black ducks failed to identify two distinct taxa, either due to horizontal gene flow, homoplasy, or shared ancestry. We analyzed microsatellite markers in modern and museum specimens to determine if the inter-relatedness of mallards and black ducks was an ancestral or recent character. 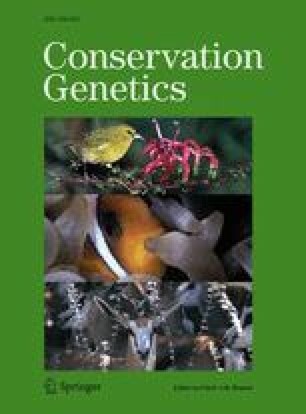 Gst, a measure of genetic differentiation, decreased from 0.146 for mallards and black ducks living before 1940, to 0.008 for birds taken in 1998. This is a significant reduction in genetic differentiation, and represents a breakdown in species integrity most likely due to hybridization. Using modern specimens, we observed that despite a lower incidence of sympatry, northern black ducks are now no more distinct from mallards than their southern conspecifics.